An improperly configured power scheme can reduce the battery life of a notebook, netbook or other mobile device significantly. It does not really have to be something that is configured deep in the operating system; Something like a too bright display can make a huge difference. Everyone can make a wrong change on the system that impacts battery life. 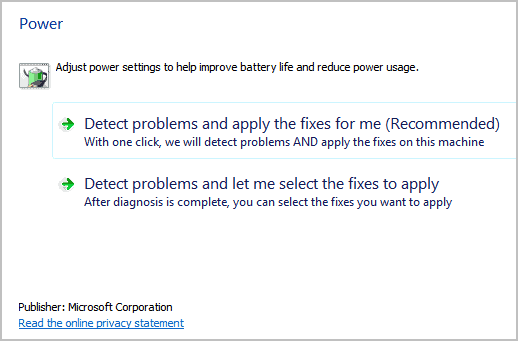 Microsoft knows that and has created a Fix It to extend the battery life of mobile computers running Windows. The Fix It furthermore can be used to troubleshoot power consumption problems on the system. Fix Its are tiny programs designed to troubleshoot, repair or optimize features and functions of the Windows operating system. The programs can be started right after they have been downloaded to the local computer system. This particular Fix It can be run automatically or manually. When run automatically, it will scan power related settings and correct issues that have been found automatically. While that's probably the better options for users without computing experience, it is suggested to run the manual power settings scan instead for detailed information about suggested fixes before they are applied to the operating system. All power issues that have been found by the scan are listed, giving the user the chance to analyze them before they are applied. Hovering the mouse cursor over a suggested fix displays a tooltip with additional information. These are usually good enough to understand the issue at hand. Checkboxes are provided to uncheck fixes so that they are not applied on the system. A click on next runs the fixes that have not been unchecked. This does not take longer than a few seconds the most. nice fix for noobs, but what noob uses ms fix its?